The Garment Saver is Here! The Garment Saver is every clothing retailer’s dream come true! Well, maybe not EVERY clothing retailer, but definitely the ones that sell high end women’s clothing. When women try on clothing, one of their biggest concerns is the possibility of ruining their hair, and or make-up.Â Clothing retailers worry about the same thing, except it’s the possibility of ruining their expensive clothing. Removing make-up stains is a difficult task, especially with fine fabrics. The Garment Saver is an amazing product that most people don’t even know about. It also works well for make-up artists who have clients that need multiple outfit changes. Even though I’m not a make-up artist, or a clothing retailer, I like to use the garment save for personal use when I change into tops or dresses with tight necklines, so that I don’t get smudge my make up, or get it all over my clothes. 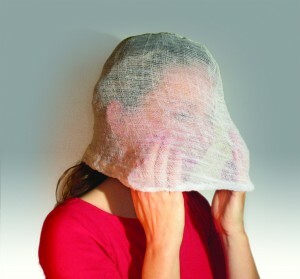 The Garment Saver is made of a sheer fabric that is 100% polyester gauze, which has been woven with a knitted fiber. The result is a soft fabric with enough stretch to fit easily over the head and stay in place without being tight against the face. The Garment Saver face hood slips over your head to keep your makeup from staining your clothes while you get dressed…plus holds your hairstyle and jewelry in place. Create your perfect look and keep it that way! Markang Packaging & Imports has been family owned and operated since 1993. Over the years, we have built long-lasting relationships by offering our customers the best quality and service in the industry. Our customers depend on us and we strive to deliver our products in a timely manner and will cater to the needs of each and every customer. .
You can rest assured that your purchase through our Web site will be secure. Our site uses industry standard SSL (Secure Sockets Layer) encryption for state of the art security. The site also uses Geotrust Digital certificate. With Geotrust and SSL Technology, information sent via the internet is encrypted to protect access to communications and transactions.